The Maldron Hotel Dublin Airport (formerly The Clarion Hotel Dublin Airport) is one of Dublin Airport’s earliest hotels and and it is also a hotel nearest Dublin Airport, being only 3 minutes walk from the terminals. 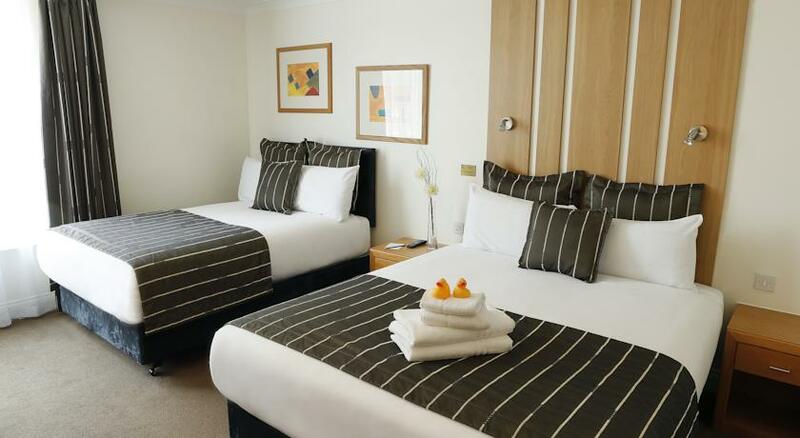 This 4 star Dublin Airport hotel has big air-conditioned rooms, an excellent restaurant and ample secure parking. There is a 24 hour shuttle bus operating between the hotel and the airport. The ALSAA Leisure Club and Swimming Pool, which is just a 3 minute walk away is available to hotel guests. The 248 rooms at Maldron Hotel Dublin Airport are bright and spacious and are furnished with crisp, cotton duvets on very comfortable beds. The en suite bathroom is supplied with fluffy towels and luxury toiletries. Rooms have free tea and coffee making facilities, plasma screen multi-channel TVs, fast WiFi internet connection and hair dryer. There is a choice od Twin, Double, Triple, Queen and Family rooms and most rooms can be either Standard or Superior. Stir Restaurant serves Irish and European food in a pleasant atmosphere. A full buffet breakfast is on offer each morning and à la carte dinner menu is served daily. Early take-away breakfasts are also available for those who can’t wait. Guests can have a more casual dining experience, snacks and drinks including cocktails at Vertigo Bar. This bar is elegantly decorated and has plasma-screen TVs and WiFi. The ALSAA Leisure Club, with its pool, gym and leisure facilities and is a 3-minute walk from the hotel. Croke Park and The 3Arena (formerly the O2) are about a 15-minute drive. Malahide Castle, Skerries Mills, the seaside towns and Morton Stadium in Santry are some of the leading nearby attractions. One of Dublin’s extravagant nightclubs, The Wright Venue, is just a few minutes’ drive of Maldron Hotel Dublin Airport.